Charles the Greater Swiss Mountain Dog x Basset Hound mix at 6 years old—"Charles loves everybody, including other dogs and our two cats. He is never happier than when all "his people" are in the same room because then he doesn't have to wander all over the house just to keep an eye on them. 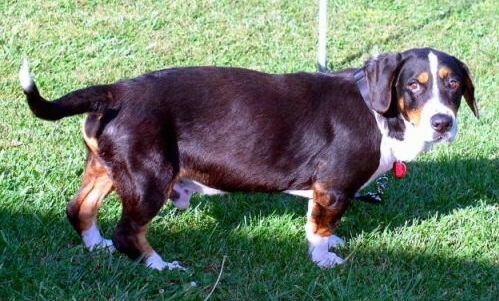 He loves his walks and is well behaved on a leash, although when he catches an interesting scent the Basset part of him takes control and he tends to ignore everything else."